If you can’t see well enough, click to enlarge; it was hard to get a good photo, but those are wasps on the stems, just below flower and/or pod. 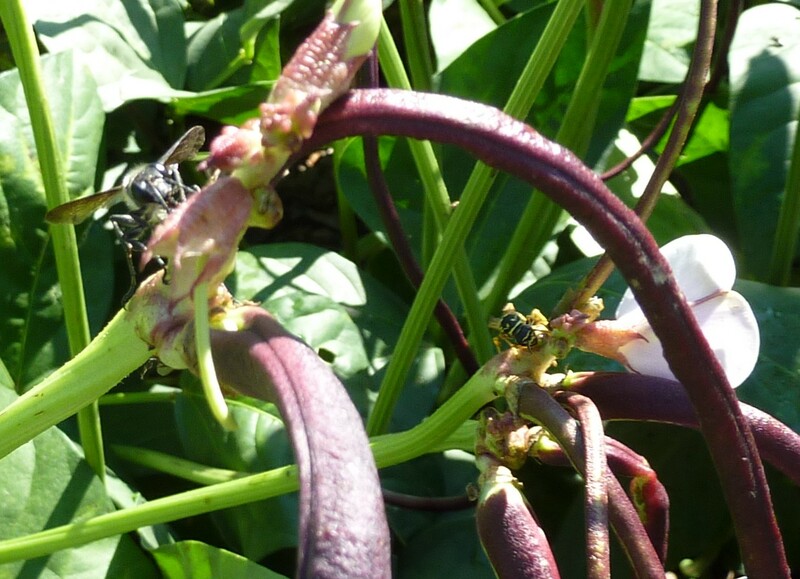 The whole bed of long beans was humming with many different species of wasps, from yellow jackets to European hornets, every size and color. I was a little nervous about getting stung, so I didn’t harvest, though I probably didn’t need to worry. I also wondered why they were there! Apparently (I found after doing some searching on the ‘net) this is a pretty common phenomenon with Vigna unguiculata varietes (our cowpeas were buzzing too, though not as much). The insects are not in the flowers, looking for nectar and pollen; they are likely sucking up something sweet exuded by the plant stems. It is possible (this has been documented in other plant species) that the plant is doing this “on purpose” in order to attract the wasps. Why, if they are not helping with pollination? Long beans attract aphids and several kinds of caterpillars, which can be destructive. Some types of wasps prey on aphids and caterpillars, usually carrying them off to feed to their young. Having wasps visit might be helping the plants survive attacks. All I can say is, the last time I grew long beans they were covered with aphids, and this year I’ve had no problems. I’m happy to keep the wasps happy, because they do a lot of good in the garden generally. Will the wasps sting me if I try to pick the beans? Probably not: they looked pretty mellow, like most stinging insects when engaged in feeding. Grabbing the stems to pull the beans off might not be a good plan, so I’ll use pruners to clip the beans off. I’ll keep an eye out for any wasps acting aggressively, as that means their nest might be nearby. Otherwise, we can share the space – and the beans! ← Tomato Patch: Do They Have More Fun in Spain? Last year I had wasps all over my raspberries .. I just picked away and didn't get stung. They actually were nibbling at the berries .. not as bad this year. Our raspberries attract all sorts of wasps too, especially yellow jackets in late August, when apparently, they're stocking up on sweets for cooler weather. I've never been stung, but I do look out for them and have never grabbed one when trying to pick a berry. Both your comments are a good demonstration that wasps are pretty gentle except when actually grabbed or threatened near the nest. Pick away!